Prescribed attire reflects the age-old traditions of our sport and contributes to the pageantry, which makes it such a memorable experience for us all. 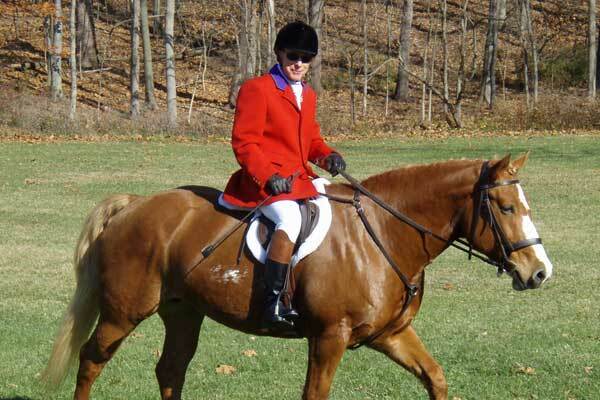 Foxhunting attire varies according to gender, seniority, and informal-versus-formal season. The following code of dress is acceptable, although the Masters always have the authority to require whatever degree of formality or informality suits the territory and the weather. 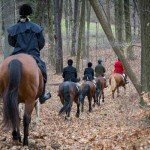 The informal season begins our fox-hunting calendar in the late summer, and continues through fall, until the Blessing Hunt the first Saturday in November, which begins the formal season. 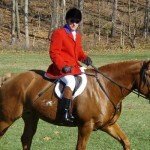 Informal season attire reflects comfort for the weather within the conventions of traditional fox hunting. Helmets: Black or brown velvet hunting cap (no vents). A helmet with harness is strongly recommended. Juniors (riders age 22 and under) are required to wear an ASTM-approved safety helmet. 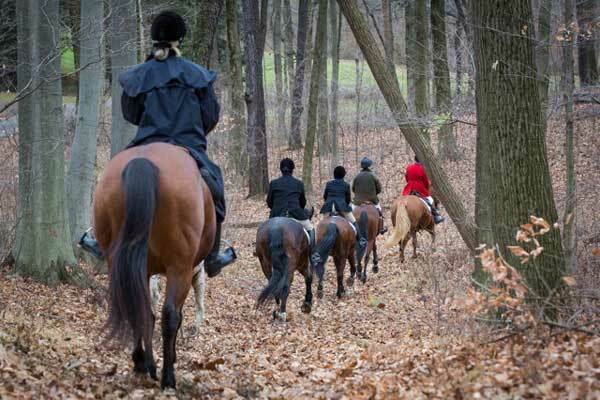 Hunt members who do not own a velvet helmet may wear a black velvet helmet cover until one can be obtained. Hair net: Unless your hair is very short, it should be neatly confined. Hairnets are advisable and correct. Shirt: In warm weather, a plain polo shirt or turtleneck in subdued color, tucked in, is correct for either gender. (Note that only RFHH staff may wear blue.) In cooler weather, it is expected that ladies switch to wearing ratcatcher shirts in subdued color with neckband or stock tie in conservative coordinating color (not white), with stock pin. Men switch to wearing a man’s shirt with necktie, which is also an alternative for ladies. Stock pin: Plain stock pins, with or without the RFHH logo, are appropriate. Ladies may alternatively wear the ornamental variety. Vest: Ladies and men’s shirts may be worn with a canary or tattersall vest (optional). Coat: A hacking jacket in linen or wool tweed in muted colors (no scarlet), tailored and vented, is appropriate. In warm weather, coats may be waived, with Master’s permission. Breeches: Any earthtone color of breeches or jodhpurs—buff, tan, gray, brown, or rust—is allowed. Belt: A belt is recommended, as it can be used as equipment in an emergency, i.e., to replace a broken stirrup, or as a sling. Boots: Boots must be clean and polished. They may be either brown or black leather dress boots (no laces) or field boots (with laces). Half-chaps are not allowed. Formal boots with brown or patent-leather tops are not appropriate. Tall, black rubber boots are acceptable, as are canvas-topped (Newmarket) boots, and jodhpur boots worn with jodhpur pants. Spurs: Spurs are optional. They must be heavy and blunt, without rowels or chains, and set high on the boot below the ankle. The straps must be the same color as the boots. Gloves: Gloves are optional. These should be brown, tan, or black leather. White wool or cotton string gloves are allowed in wet weather. Rain gear: Unless specified on the RFHH hotline, sport goes forth even in precipitation. On such days, the Masters may choose to allow hunting coats to be replaced by rain jackets. If so, the jacket should be a Barbour oilcloth coat, or similar style, preferably in a black, tan, green, or brown color. When visiting another Hunt, ask your host what is proper. Hunt whip: A regulation hunting whip is optional for those with colors, or staff. Thong and lash may be removed during cub hunting. A short, plain-colored riding crop is also optional. Wire cutters: Wire cutters carried in a leather case attached to the saddle are optional. 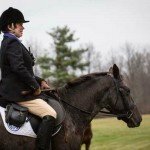 Flask and sandwich case: A pocket flask is optional; alternatively, gentlemen may carry a flask or sandwich case (or both) attached to the saddle, and lady members may carry either a sandwich case or a combination flask and sandwich case attached to the saddle. Be prepared to share! Formal season opens with the Blessing of the Hounds on the first Saturday in November. From the Blessing until the end of the season, formal hunt attire is required. Helmets: A black velvet hunting cap is required, and the Masters of the RFHH strongly recommend a hunting cap with harness. Juniors (riders age 22 and under) must wear an ASTM-approved safety helmet. Hairnet: Same as for cub hunting season above. Shirt: When coats are waived due to warm weather during formal season, riders must wear sleeved white riding shirts. With coats, a white shirt or turtleneck is required. A white or cream stock tie with stock pin is required for formal hunting. Stock pin: Same as for cub-hunting season above. Vest: Vests should be canary or tattersall. Coat: Gentlemen who have not been awarded colors must wear a plain black hunting coat or frock coat. 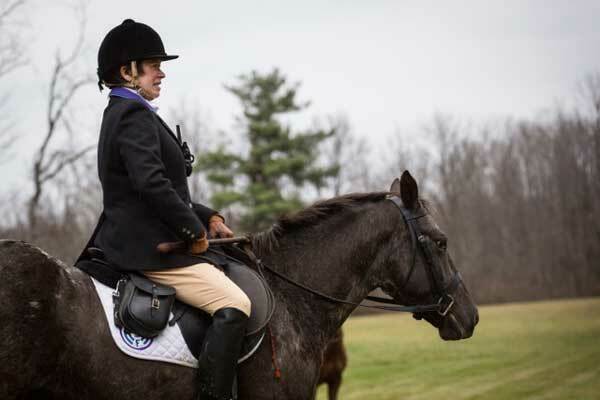 Lady members without colors must wear a plain hunting coat or frock coat, preferably in black, but navy and dark gray are also permitted. For field members, the coats must have three plain black or navy (to match the coat) front buttons; only the huntsman and masters may have coats with four or five buttons. Frock coats (which have a seam at the waist) have two additional buttons on the back. Coats must be buttoned at all times. Colors: Ladies awarded colors add purple facing and light-blue piping to coat collars, referred to as the “Hunt Collar,” and buttons are changed to black engraved RFHH buttons. Gentlemen awarded colors and lady Masters may wear scarlet frock coats with the Hunt Collar and brass buttons. A black, charcoal, or dark navy blue shadbelly may also be worn, with the Hunt Collar and black buttons with the hunt’s emblem, and is suitable for formal days such as Opening Meet and Blessing of the Hounds. 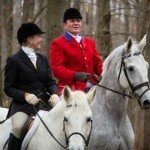 It is not appropriate to wear colors while visiting another hunt without prior approval from that Hunt’s MFH. Breeches: Gentlemen without colors wear tan and lady members wear tan or canary breeches. 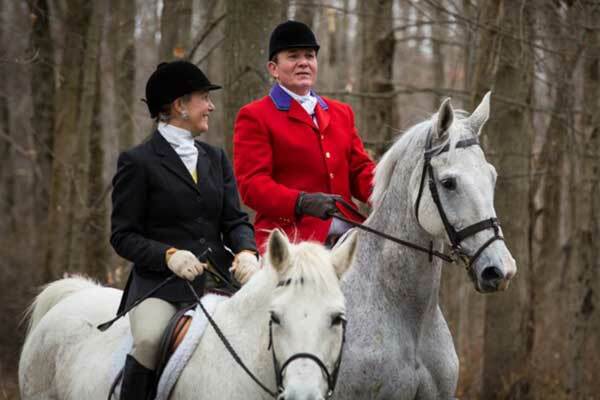 Gentlemen with colors and lady Masters must wear white breeches with scarlet coats. Belt: Same as for cub-hunting season above. Boots: Boots must be clean and polished. Dress boots (no laces) are traditional wear. Plain black boots without tops should be worn with black hunting coats. Lady members with colors wearing frock coats have the option of adding black patent leather tops (sewn on). Gentlemen with colors and lady Masters wearing frock coats (black or scarlet) may add russet leather tops to their boots (sewn on). Tall black rubber boots are acceptable, especially in wet weather. Spurs: Same as for cub hunting season above. Gloves: Same as for cub hunting season above. Raingear: Same as for cub hunting season above. Hunt whip: Same as for cub hunting season above. Wire cutters: Same as for cub hunting season above. Flask and sandwich case: Same as for cub hunting season above. The step-by-step drawing below is courtesty of Horse Country. Where can you find appropriate attire? Some of our member’s favorite sources are listed on our Favorite Places Page.